Branching! Get it? 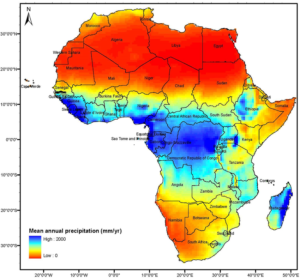 We’re excited to report that Trees That Feed Foundation now has excellent partners in Africa, folks we know and trust and can work with effectively and efficiently. So we’re extending our reach. Last week, working with our suppliers in Germany, we shipped 750 breadfruit trees by air to Nairobi, Kenya. They were successfully cleared through customs and quarantine, and are being held now in a shade house. There they will strengthen and grow for a few weeks, and later be moved out to farms. They are destined for suitable locations in Kenya, Uganda, Tanzania and perhaps points beyond. 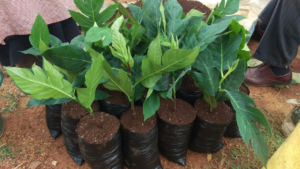 The photo shows young breadfruit seedlings that have been replanted into grow bags, where they will sit for a few weeks. 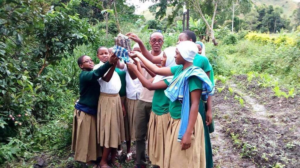 This photo shows local ladies in Kenya, delighted to be receiving tree saplings. Joe Mataro and his team from Grace Project worked hard to get this accomplished, from import permits to replanting in the right size grow bags. Thanks, Joe, for all the hard work involved!